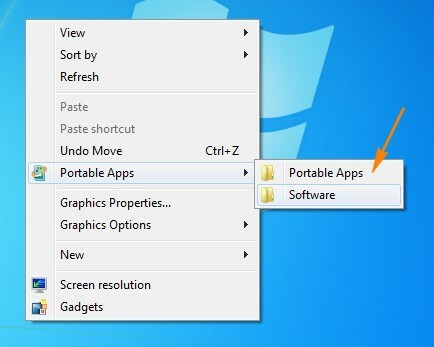 Windows Desktop is commonly used to place shortcuts to commonly used files and folder on the system, its always better looking to have a clean looking desktop with minimal icons on the desktop.If that’s what you are looking for then Right Click Enhancer can help create shortcuts to important files and folders In My Computer along side the system drives, add short cuts to Control Panel.It can also extend shortcuts to the context menu for moving files to frequently used folders or create new context menus. My Computer Manager : This helps add shortcuts in My Computer and Control Panel along side the default shortcuts and icons ie., drive icons, control panel icons.It has 2 modes Simple and Advance, where in the simple mode lets add files and folders to My Computer or Control Panel.The advanced mode lets the shortcut be customized ie., add icon, pass arguments. Right Click Cascading Menu Shortcut Creator – This lets create a new cascading menu and this entry is available in the explorer, for ex., after creating the cascading menu just look for the menu by right clicking on the desktop.To add a new menu, just open up Right Click Enhancer Menu Shortcut Creator, and next click the Add Cascading Menu, to create a new Menu.Next to add shortcuts under this menu select the newly created menu and click “Add File” to add a file under the menu or “Add Folder” to add a folder under the menu.Only 1 level deep menu can be created. Create File List, Copy To Folder, Move To Folder, Open In Notepad, Administrator Command Prompt, Encrypt, Print File List, System Configuration Utility, God Mode, Problem Steps Recorder. Right Click Shortcuts Creator – This allows users to add files and folder under the context menu.As you can see in the image below, a shortcut to a PDF file is part of the context menu. Send To Manager – This option makes it easier to add target folder(s) where you frequently save file, and add to the “Send To” of the context menu. Right Click Enhancer is compatible with Windows OS and requires .Net Framework 3.5.Its available in both Installer and portable versions.